Have a file you'd like Impact! to 3-D print for you in high quality durable (not brittle) resin at 1/20th of a mm of detail at 40% less and half the time of other popular 3-D printing services? 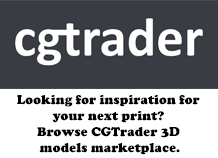 2nd - fill out our 3-D print contact form with your information (specifically email and country). I will get working on your prints as quickly as possible (most prints ship within 5 days of payment for the prints). Normal unmounted heroes (like provided by services like Hero Forge cost $6 to $9 to print. Mounted figures (like on a horse or motorcycle) or normally $16 to $20. Shipping is a one time fee no matter how many prints are ordered and is $5 for orders going to the USA, $10 for Canada and $15 for Rest of World. To save money on your print Impact! recommends not putting any name on the bottom of your base as it can easily add $1 or more to the cost to print your figurine. A monthly subscription box filled with create Chibi miniatures Would you like to receive a suprise box each month of the best unpainted chibi character miniatures? Or how about a gift for a difficult to shop for friend? 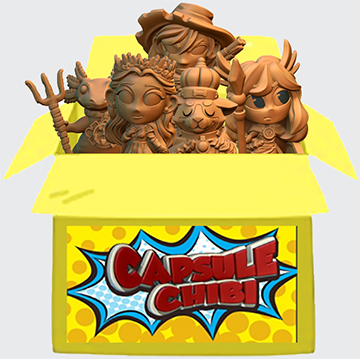 Sign up for Capsule Chibi Crate! A monthly box of 5 or more chibi miniatures will show up each month and the longer you subscribe, the less expensive each box becomes!